This Sunday we have another parable located in a vineyard. The story is an allegory: the landowner is God, the vineyard is Israel, and the tenants are the people of Israel. The servants are the prophets who endured insult, imprisonment, beating and even death to bring God’s message to the people. The final messenger is God’s son – the Messiah and heir. Jesus uses the imagery of Isaiah’s Song of the Vineyard as the religious leaders continue to question his authority. Jesus begins by describing a common practice in first-century Palestine in which an absentee landowner planted a vineyard and then leased it out to tenants for a share of the final crop in payment. At harvest time, the landowner sent his slaves to collect his share. However, the tenants beat the slaves and killed one of them. When the landowners sent even more slaves a second time, they too were beaten and driven away. Thus the landowner decided to send his son in the belief that “They will respect my son”. However, the tenants plotted together and killed the son in order to seize his inheritance. What is a tenant? Hopefully, it is one who is a faithful steward, who cares for the property on which he lives. We can be considered God’s tenants of his creation – we have been given a “property” in which we are to care for, till the soil, plant and reap crops. We are God’s workers, and God demands a way of life that results in the fruits of God’s kingdom. What does today’s parable teach us about stewardship? Stewardship is more than a financial pledge to the church. It is a way of life in which we all recognize our responsibility to be faithful stewards. The story of the wicked tenants describes an economic arrangement that would have been familiar to Jesus’ listeners. What does the relationship between the landowner and his tenants suggest about our relationship with God? What is God like in this story? What do you think should happen to the tenants who killed the landowner’s slaves and son? In the final verse, Jesus calls us to produce the “fruits of the kingdom.” What are these fruits? What can happen if we fail to be good stewards of God’s gifts? 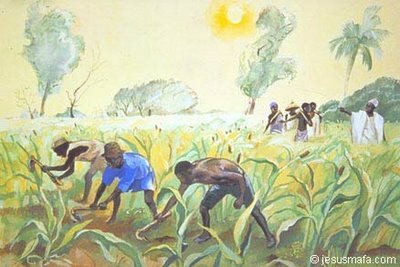 This entry was posted in Ordinary Time and tagged Jesus, Lectionary, Parables, Stewardship. Bookmark the permalink. Trying to locate the author of the Collect for Proper 22, Year A. Help? ?